More Halloween fun today! I’ve cooked up another accessory that hopefully will look good on just about everyone, from men to women to kids and adults. 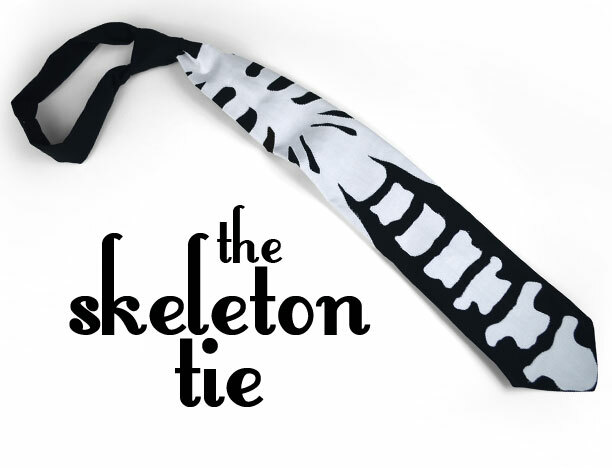 This time around it’s a tie that’s made up with some ribcage and spinal cord appliqué that’s perfect for topping off a simple costume or maybe a casual Friday bit of Halloween cheer. 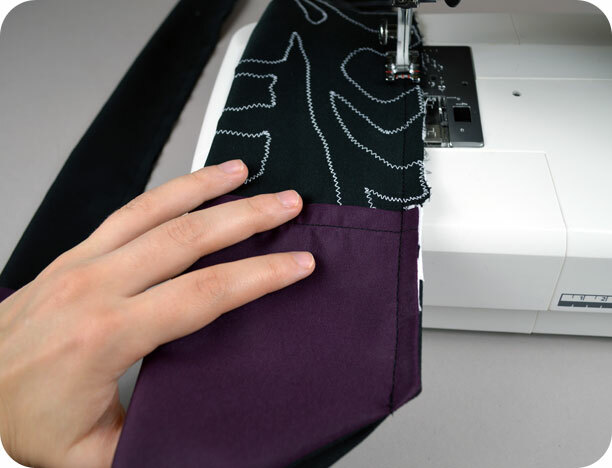 While ties are typically pretty easy, some parts can be a bit tricky because they’re made with silk cut on the bias and often involve a bit of hand sewing. I’ve simplified the process even further to make the pattern super quick to churn out, making it perfect for a costume tie. Of course you could use the same pattern and decorate it however you choose! Maybe a zombie or Frankenstein tie :B! Or even some well-placed blood splatters would be excellent for Halloween 😀 Either way, with only two weeks left until Halloween, hopefully this will be easy to pull off if you need a costume in a hurry. The appliqué was placed specifically so it would look relatively anatomically correct on the average adult, but you could easily scoot the ribcage down and take off some of the lower vertebrae to make it fit all kinds of sizes. Really simple! The appliqué is definitely the most difficult part, but even that can be skipped. 1. First of course is all the appliqué. This is a real doozy but I don’t mind a lot of appliqué. I did mine by tracing the appliqué pattern onto lightweight fusible web, cutting out the shapes, then ironing the fabric onto the tie according to the pattern guidelines. I then sewed it on with a zigzag stitch around all the shapes. 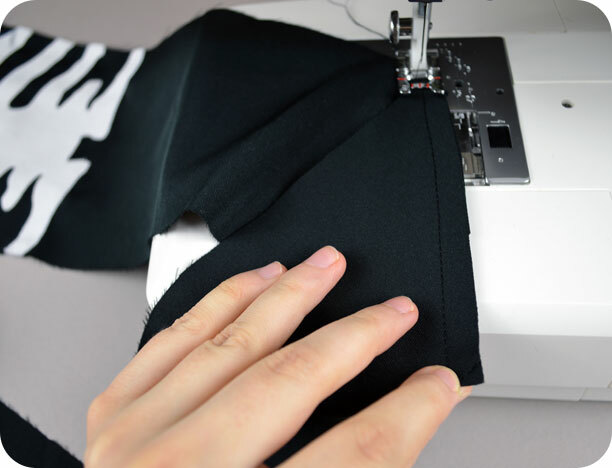 You could also use heavyweight fusible web and skip the sewing altogether – the adhesive in heavyweight fusible web is meant to be enough to hold the fabric on its own. 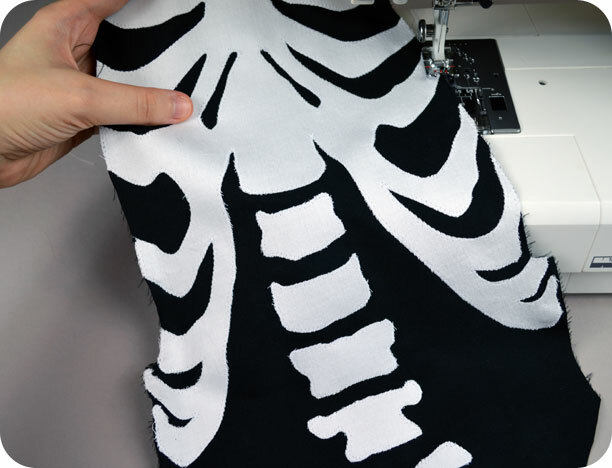 Alternatives to all this appliqué include using the pattern as a freezer paper stencil and painting the ribcage, but one idea that I thought would look especially cool would be to bleach the fabric while using the skeleton stencil. 2. Next we add on the facing sections for the points of the tie. For each lining bit, we need to finish the upper straight edge. I did a quick zigzag along the raw edge to finish it nicely, but after that you just need to do a simple single-fold hem. Fold it over by 3/8”, iron it in place, then sew it down. Repeat this with your smaller facing section as well. 3. Now you can sew the facing to your tie. Line up the facing against the point of your tie with right sides together and sew around the sides and bottom edge. Leave the top free for turning it right side out in a bit. Trim the seam allowances, turn the tie right side out, the press the seam flat. Repeat this with the other end of your tie and the remaining facing piece. 4. To join the tie ends together, simply line up the diagonal seam found at the end of the tie halves. If you line them up with right sides together they should match up nicely and you can make a seam like usual. Be sure to press the seam open when you finish. 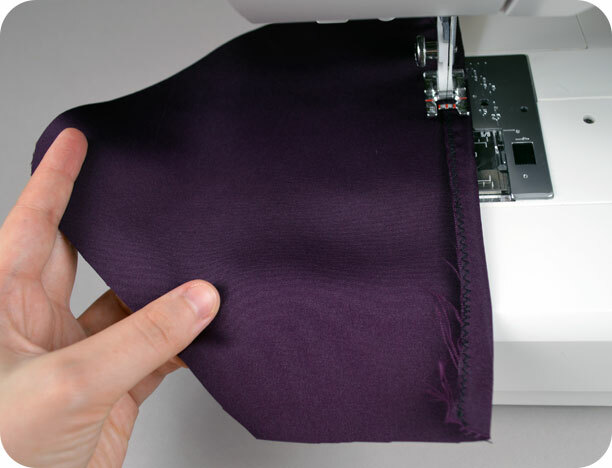 The reason for this diagonal seam is so that when you have the tie is finished this seam will take up very little bulk as opposed to a horizontal seam. Categories: Accessories, Free Projects | Tags: black, bone, cord, cosplay, costume, cute, dead, diy, free, how to, kawaii, pattern, project, ribcage, sewing, skeleton, spinal, suit, tie, tutorial, vertebra, vertebrae, white | Permalink. Maybe you can go into business;) Super cute! I sew a ltltie too. I would still love to finally sit down and knit a whole scarf. One day I would love to make a quilt…one day!